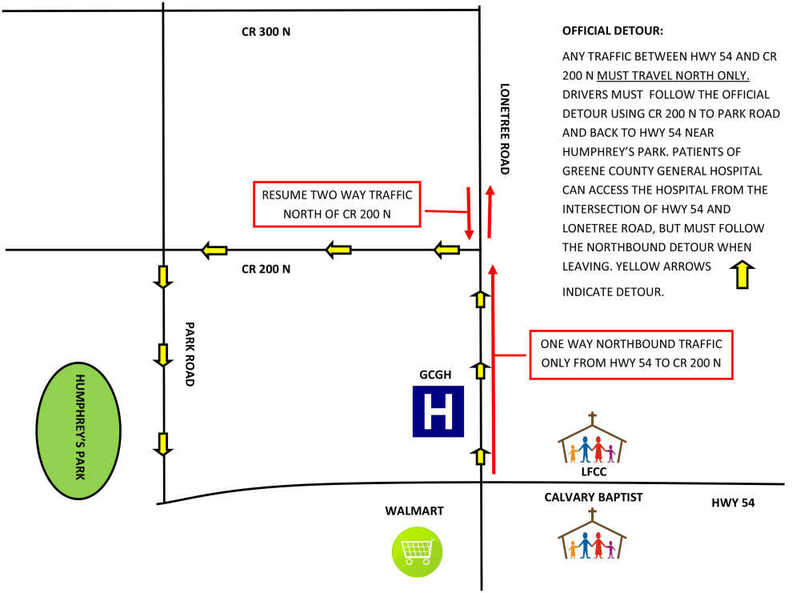 This image, provided by Greene County General Hospital, details the changed route during the Lonetree Road Rehabilitation project. 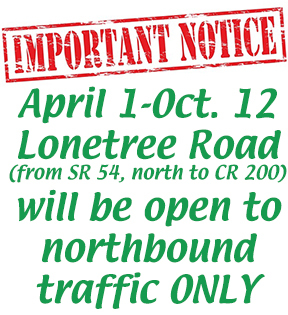 Traffic will be restricted to northbound only starting approximately April 1, weather permitting. While the upcoming Lonetree Road construction project will cut a portion of the road down to northbound traffic only, a plan has been put in place which will not disrupt medical services at Greene County General Hospital (GCGH) and its neighboring clinics. RQAW Project Manager Greg Ellis said the Lonetree Road Rehabilitation Project will begin at State Road 54 and will end a half-mile north of the highway. During construction, which is expected to last from approximately April 1 to Oct. 12, the portion of Lonetree Road from State Road 54 to County Road 200 North will be restricted to northbound traffic. GCGH Director of Marketing Stacy Burris said this project will mean great things for the hospital, but they want to stress that several scenarios have been considered in order to ensure patient safety during the construction. “When we are done, it will be three lanes wide through the medical park area with a center turn lane, just like in town. It will have curbs -- right now it’s just open ditches -- and it will have sidewalks on both sides, overhead lighting. We are going to put in a complete underground drainage system,” Ellis explained. During the construction, Ellis stressed the area of Lonetree Road from the highway to County Road 200 North will be open to northbound traffic only until October. Anyone traveling south on Lonetree Road must take the official detour, which includes turning west onto County Road 200 North to Park Road, then traveling south back to State Road 54 by Humphreys Park. The first phase of the construction project will block off the northbound lane, pushing the northbound traffic into the southbound lane while crews widen the original northbound lane. The second phase will transition the traffic back to the widened northbound lane while they work on the southbound lane. The third phase will transition the northbound traffic back to the southbound lane while crews reconstruct the lane. Phase four will open the road to traffic with flaggers in place while they put on the final touches. Burris explained a detailed plan ensures there will be no added time to ambulance departure or arrivals, as they have their own set path coming to and from the hospital. She said the same goes for all local emergency personnel. They are aware of the temporary changes, thus not impeding on patient care and safety. “They (RQAW) have been great, working with us and communicating with us. The commissioners have been wonderful, ensuring that we have full access to the hospital at all times. The medical center will always have access as well,” Burris explained. Individuals headed to Greene County General Hospital will have a couple of options for entrance. GCGH has three driveways. At the north driveway, Ellis explained only half of the drive will be closed at a time. At the south side of the hospital where the two drives are located, only one will be closed at a time. Ellis noted the contractors have also worked to ensure people who live in the area can still get home. “We will make allowances for the local traffic. If you live between that .5 mile mark and County Road 200, you will be able to come through and get to your home. Everyone there will have full access to their homes at all times, as well as the hospital,” Ellis said. Ellis said in order to make the project work smoothly in the area with heavy traffic, several agencies have had to work closely together. He credited the Greene County Commissioners Nathan Abrams, Rick Graves and Ed Michael for their hard work on the project, as well as the Greene County Council, City of Linton and Greene County General Hospital for contributing. “They have all worked very hard to get this project funded, first and foremost, then to work through the design and development portion of it to bring it to where it’s currently at in the construction phase,” Ellis said. Burris said project and county leaders have worked diligently to ensure the project goes smoothly for the hospital and clinics. “Please be patient. This project includes added safety for the hospital by adding that turn lane,” Burris stressed. Ellis also reminded motorists to be extra careful, watch their speed and pay attention as they navigate the construction zone, noting many of the employees are from the area. “Our primary contractor is E&B Paving, out of their Switz City plant,” Ellis explained. A stop light would have caused traffic to back up into the highway as they wait to travel north. That would be a mess! Tim Egnew, Where and why? Curious.. It sounds to me like this is far better plan than I had heard .previously... I thought they were going to send traffic beside (North) Autumn Trace and out at the road that comes out East of lfcc.. Does it really matter that several of the workers may be from the local area? We all need to pay particular attention and be aware of our surroundings when driving through road construction sites wherever they may be and whether or not the people working in them are from the same area as we are.